Next we explored the northwestern tower. The door was locked. There were some carvings on the door that looked Elvish in nature. The upper reaches of the tower were shrouded in vines from the forest canopy. While we were looking at these vines they started to move! It turned out that these were assassin vines. We were able to pretty easily kill the vine, but we did take a few hits during the fight. Our cleric was nice enough to get us all healed up. Then the fighter smashed open the wooden door with Elvin carvings before anyone could stop him. There were some more vines inside the tower walls, we immediately got into a defensive position in case they decided to attack. Luckily for us it turned out they were not going to kill us. 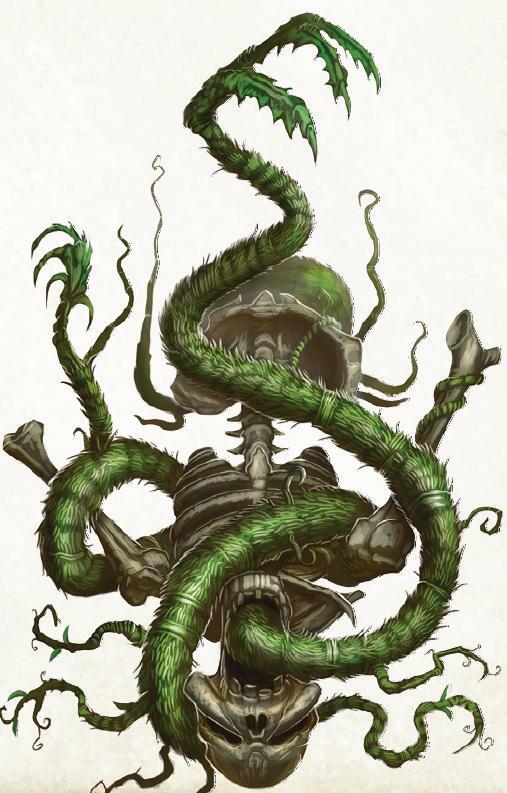 While we were distracted by the vines (that turned out to be fine) our fighter was attacked by some weird looking mutant Elf creature. 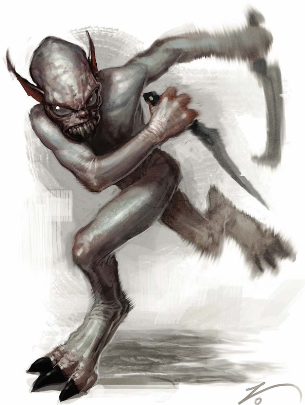 I later learned that this creature is called a Grimstalker. He got such a huge sneak attack off against our fighter that our fighter was damn near killed in 1 blow. The rogue went after him while our bard started doing his magical singing that makes us all stronger. I managed a hit off on this creature, but just barely touched him. Our cleric was able to get some healing done on our fighter. He was still looking pretty beat up, but the majority of the blood loss was curtailed. The rogue and I managed to get a few more hits in each. He was very difficult to get a hit off on him. He moved quite fast. Finally I was able to catch him off guard and got a really good hit in on him and killed him. We found a chest hidden in the back of the room. Our rogue picked the lock on the chest. We found some pretty awesome bling inside. We decided it was a good time to take a break. Skoll (my wolf) guarded the entrance, while those of us who don’t need a full nights rest to get back our magic took turns on guard duty. After my guarding time frame was over I took an hour to meditate so I could replenish my own spells, and then got some sleep. We also went and fully explored the previous tower that the quickling and come from. He apparently liked to scalp his previous victims, as we found a number of scalps nailed to the wall. We managed to find a few gems and a little bit of gold in his tower as well. We went for the third tower and found a lot of organic refuse. There were a few rats chewing on human flesh that scurried away from the light when we entered. Then all of a sudden we saw the rats coming back. There were a whole lot more of them. The rats were just pouring out of cracks in the walls and ground. It looked to be several rat swarms. I was able to use my shield to basically smash the rats in between my shield and the ground. 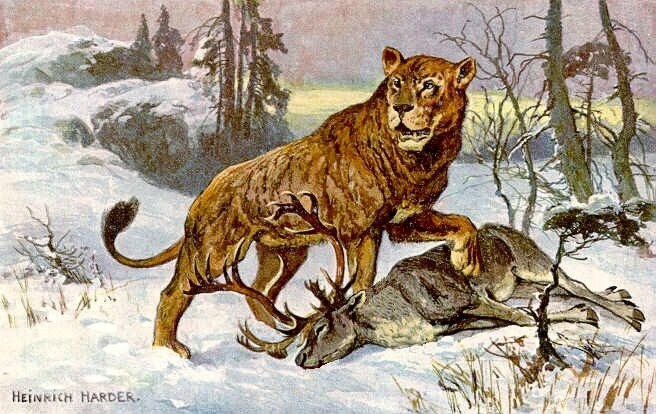 This was pretty effective in killing them, but there were just SO many. I called Skoll into the room once I had the swarms distracted and on me, and he was able to bite them and rip their heads off. There were so many that when I was smashing my shield into the ground it was coming back up completely covered in blood, with rat bodies impaled on my shield spike. I was able to do considerably more damage to the rat with my shield than the others in my party were with their weapons. We finally killed off the last of the rats. The fighter then proceeded to take a lot of rat blood and guts off my shield in his hand and smear it all OVER our clerics dress. She was PISSED at him, while the rest of us were laughing. Lastly we explored the last tower on the outside edge of the keep. It contained some trinkets, as well as a statue of a god that I’ve not heard of before. Finally we got to the inner tower of the keep. We went up the stairs and came across an elven woman at the top of the stairs. The elf woman started dancing and we all became dazzled by her dance steps. There was some serious magic going on there. Interesting side note, our cleric is a lesbian, so even she was dazzled by this woman’s dancing. The dancing was so good that none of us were even able to move. She started playing really close attention to our bard (a half elf). She seemed to be very attracted to him. Our cleric offered up our bard in trade for letting us go. While amusing to the rest of the party, the dancing elf lady just ignored us and kept grinding up on the bard. The dancing elf lady then actually tried to tackle our bard, while at the same time reaching for the lace at the front of his pants. While disturbing to see, she finally stopped dancing and we were able to attack her. We started landing blows against her, and she seemed to be trying to bite the bard on the neck while still fumbling at the front of his pants. The bard later said it felt like all the energy was being drained from his body when she was doing that. After another few attacks with some stops in there for us when she started dancing to distract us again we were finally able to kill her. It did however take a lot longer than it should have. After killing her, and looting her house for every bit of loot we could find we headed back to town. Upon arriving I felt much stronger than I had previously. I also noticed that Skoll looked considerably stronger as well. (I’ll metgame here for a moment and let you know we leveled up). I also found out from Oleg that my new magic bashing shield had come in. It is a much tougher shield and looks like it will do a lot more damage to my enemies. So after the adventure with the tree demon we returned to the capitol to make sure everything was running ok. After that we continued to explore the land around our capitol. We want to get as good of an idea as we can as to what is around it. While exploring we came across the ruins of a keep. The front door of the keep had arched door ways, the doors long since rotted away. Our fighter decided to walk through the doors without checking for traps. Several tons of stone started to come down on top of him as he went in. Luckily his reflexes are pretty good and he was able to jump out of the way at the last second. There were 4 towers, one in each corner of the keep. The towers each had doors on them, and strangely the doors looked to be pretty new. Our rogue decided to walk up and knock on one of the doors. No one answered, and after checking for traps we opened the door. Inside were dead bodies nailed to the wall. There was blood all over the place. While we were marveling over the room our group was attacked from behind. We found out later it was a Quickling, but at the time we were unaware as it attacked, and then stealthed and ran away. The quickling hit like a truck. When he stabs you it hurts! Healing from our Cleric was required so we could move forward with fighting this thing. The biggest problem with trying to fight him though was finding him. There was also a smaller tower inside the center of the keep. We thought that the Quickling would be in the tower room, so we stuck someone at each one of the entrances to make sure he couldn’t escape. Our Summoner was casting oil on the floor in hopes that the quickling would move through it. I cast Entangle in the room in hopes of snagging it in place. Unfortunately when I did that it managed to tangle up a few of our party members. Ooops, sorry about that guys. I was actually entangled as well. Realizing I wasn’t going to be able to move I sent Skoll (my wolf companion) around to the other side in case our Rogue needed help guarding the door. This actually really helped things quite a bit because the Quickling decided to attack Skoll. A Quickling must become visible to attack. 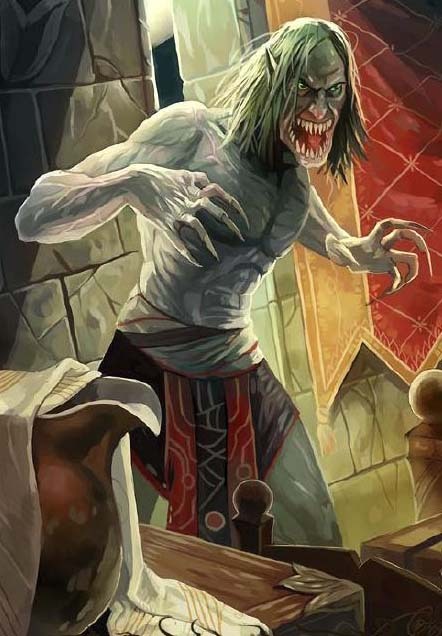 Our Bard was also on that side of the door with Skoll, our rogue and the Bard was stealthed, so the Quickling didn’t know the Bard was there. The bard came out of stealth and started playing a song that forced the Quickling to lay on the ground laughing. It was just the opportunity we needed! Our Cleric was quick to get over to the Quickling and cast Faerie Fire on it, which basically caused it to glow. After that was cast the creature was able to take off. Some quick thinking with our fighter and his bow, he was able to get out and start attacking the Quickling again and distract him so the rest of us could catch up. Skoll, myself, our rogue, and our fighter all managed to surround the Quickling and dispatched of him. The hour grows late, so I must retire for the evening and rest up for tomorrows adventures. Hello, my name is Ricven. 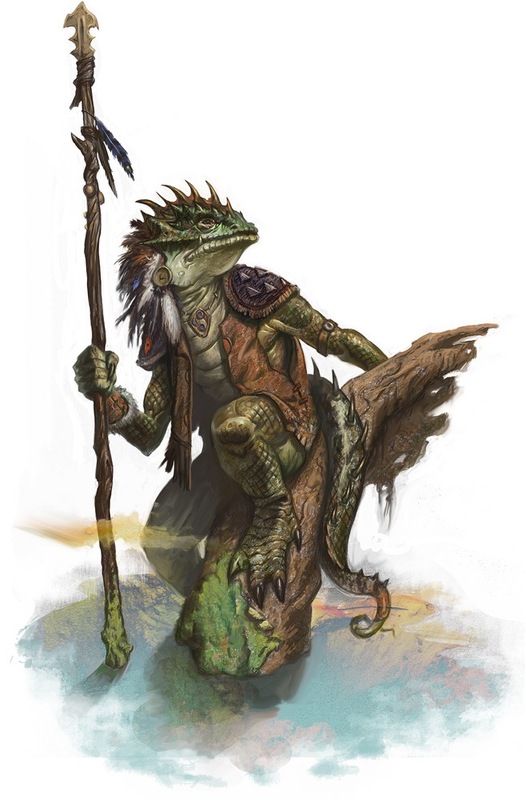 I’ve been tasked by the leaders of Brevoy to go to the Stolen Lands and help a group of adventurers take back those lands from the monsters and bandits that live there, and establish a new kingdom. I guess to start with I should describe myself. I am a young human male, 5’8″ 170 lbs with blonde hair. I am a Ranger. I spent much time in the forests around my home learning how to live off the land. I’ve become very good at what I do.. I decided since this is the first time venturing away from my home I wanted to start a chronicle of my adventures. After traveling many days from my home I managed to come across the group I had been looking for at a local temple. It was dark when I arrived, so I do not know to which god the temple was dedicated. When I approached the camp I saw the bard on duty and hailed him as I approached. It was a tense few moments when he saw me and did not know who I was. I produced my charter and was able to convince him that I was a friend and not a foe. I settled down with everyone else for the night and got some rest. It’s a good thing I did too, because the next day was going to be a long one. Upon waking in the morning I made my introductions to all my new companions. We set out following the path of the river. Then we came across some loggers who seemed to be cutting down the trees in one of our areas. We also noticed that there was a fairy who seemed to be pretty angry with the loggers as they were cutting down her home. After some discussion with the loggers we were able to convince (intimidate) them into moving further up river and leaving the fairy’s home alone. In retribution for the cutting down of the trees that the loggers had taken we took several kegs of beer from them and loaded the kegs onto our horses. The fairy seemed indifferent to the whole thing, but she also knows that she owes us a favor. We then pressed on. Much later, towards evening time, we came across a band of gnomes who had gotten their wagon stuck in the water. The fighter in our group, and I, both waded out to help. Out of our group we are the best with animals, so it was the logical choice for us to head out. The gnomes were thankful for our help, and agreed to sup with us. While talking to the gnomes, they mentioned that they had a map of some unexplored by us areas. We tried to trade for the map, but unfortunately, the price was too high for us to be able to afford a copy of their map. They even offered us a discounted price since we helped them get their wagon out of the water, and it was still too high. The rogue in the party excused himself to go relieve himself in the woods. What we didn’t know at the time is that he was going to try and steal the gnomes copy of the map. Unfortunately the gnome leader was not quite as inebriated as we thought he was, and he did spot our rogue. The rogue was able to bluff his way out of the situation though as he himself had quite a bit to drink that evening. Once the party died down we went looking for our ultimate goal. We needed to kill the Stag Lord, supreme leader of the bandits in the area. There was a bounty on his head. My companions had previously met one of the bandit party leaders while they were out raiding honest people, and so knew what he looked like. The bard cast a spell on our cleric to make her look like the bandit leader we had met before. 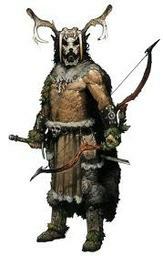 After giving the wrong password at the gate to the bandit camp, we managed to convince the guards at the gate that we were bandits returning with the spoils of war for our leader the Stag Lord. The guards sent someone to wake up the Stag Lord himself and come see what we had brought him. The Stag Lord appeared drunk when he showed up at the gate. We gave him a taste of the beer that the loggers gave us. He enjoyed it so much he immediately insisted the kegs be taken back to his tent. As the Stag Lord was turning away, our rogue tried to attack him. Noticing his attack I immediately pulled my shield off my back and got ready to attack. The Stag Lord tried to run, the guards seemed a bit confused as to what was going on, and the combat broke out. The first thing I did during the combat was bash the closest guard with my shield. The guard fell dead at my feet on my first hit. Another guard tried to run away after seeing the first go down, and as that guard was running I managed to bash her with my shield. She also fell dead at my feet. This continued to go on for what seemed like forever. We also met a Paladin who had reluctantly joined the bandits in an effort to survive. This is where I will end my tale for now. 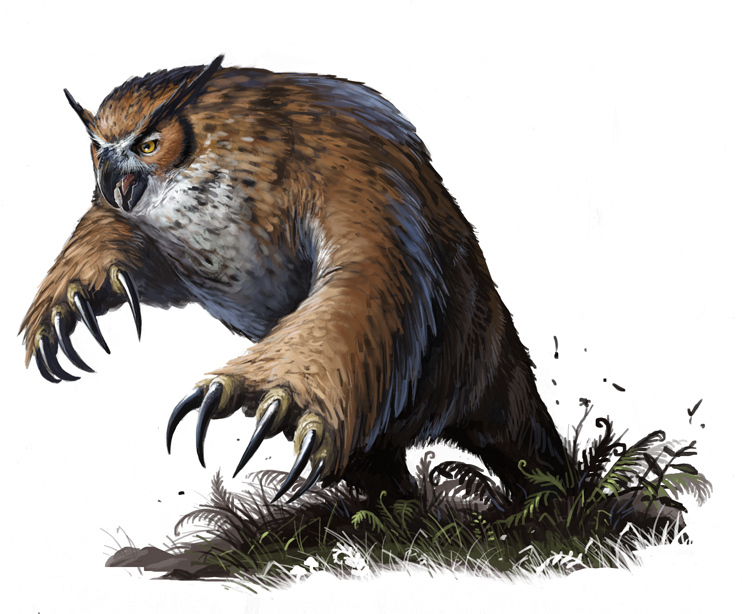 In the interim, please see my sketch of the Owlbear we faced. 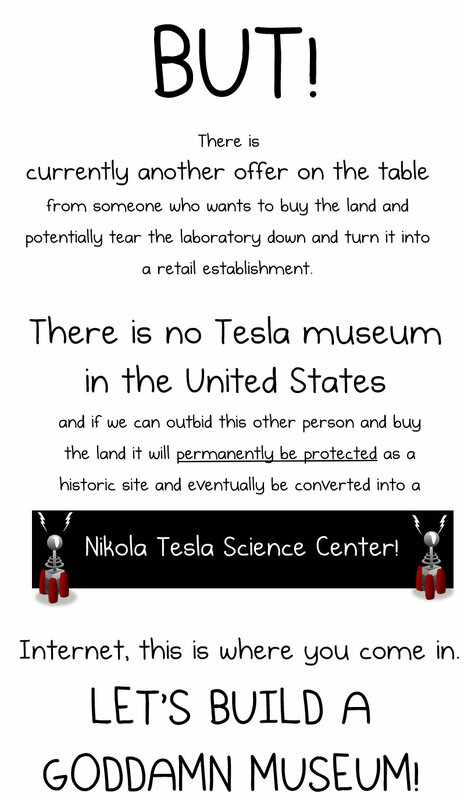 We Need A Nikola Tesla Museum! 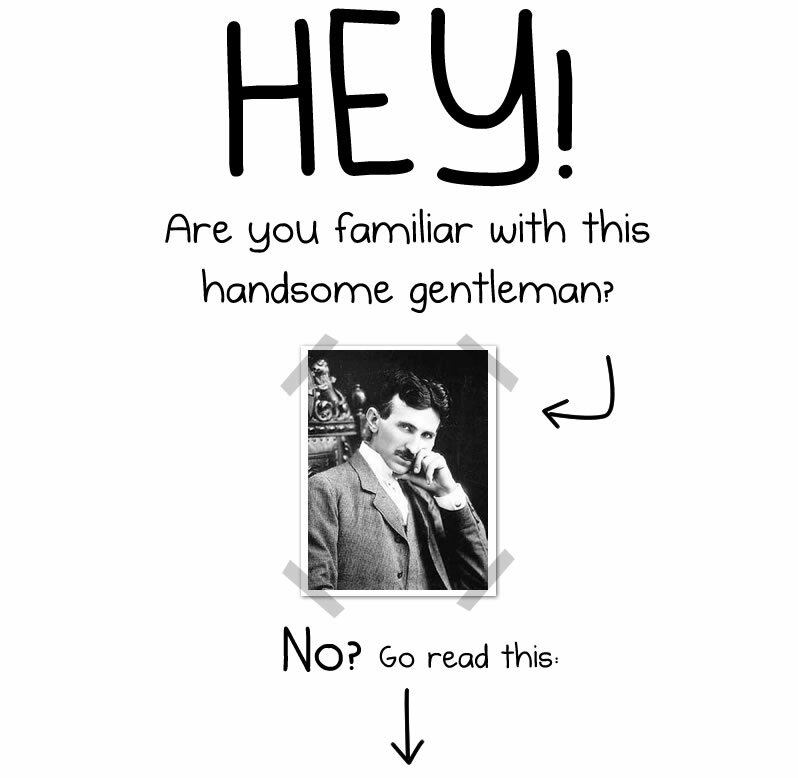 I straight up copied the below from The Oatmeal. 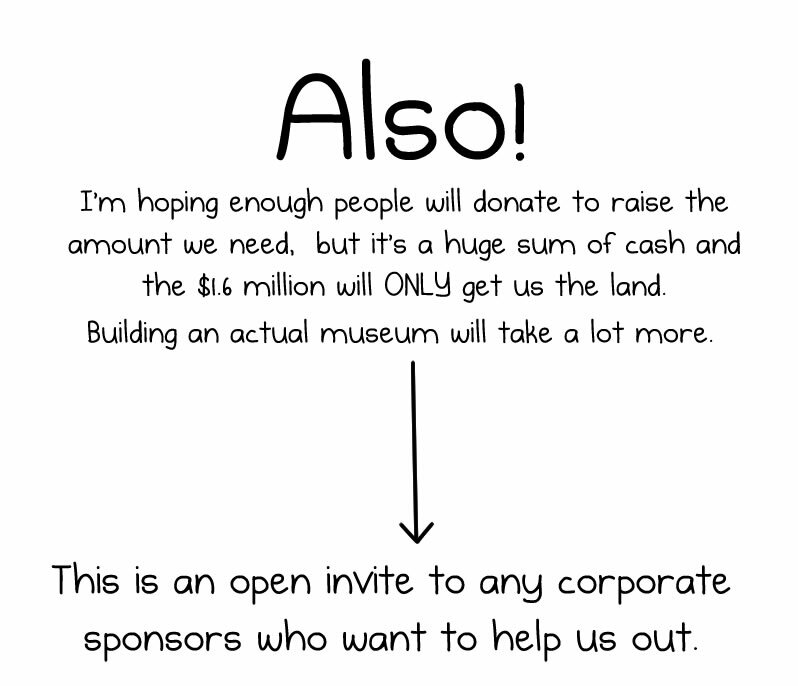 I think it is really important for this museum to be built, so I’m posting this here. What happens if we don’t raise the entire $850,000? The Indiegogo campaign is set up as a flexible funding campaign, so no matter how much we raise it will still go to the non-profit and toward making an offer on the property. $1.6M is the asking price, but we’re hoping to buy it for less and then use the remainder of the money renovating the property. What happens if we raise more than we need, or if you make a lower bid on the property and there’s money left over? The property the laboratory is on is a bit of mess. It needs to be cleaned up, restored, and there’s a ton of work to be done to actually turn this into something worthy of Tesla’s legacy. The money we’re raising is simply to secure the property so no one can ever mess with it and guarantee that it’s a historic site. 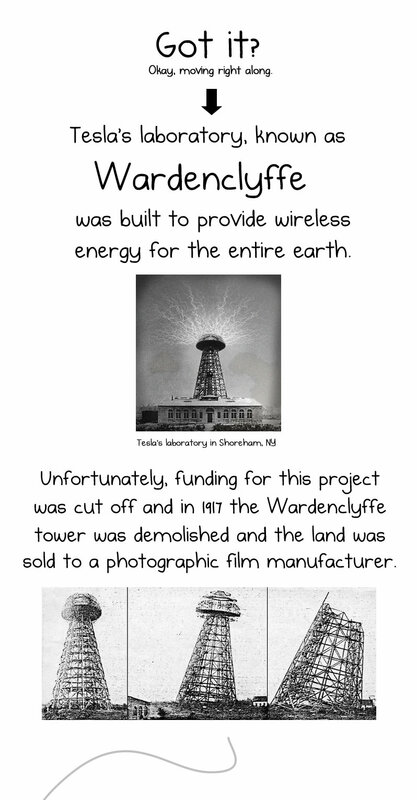 It opens up years and years of time to figure out how to build a proper Nikola Tesla museum.